One of the best things about being an advocate for OCD awareness is connecting with other people who have OCD and hearing their stories, especially when they’ve decided to turn their pain into something positive by helping others. In this Q&A, I get to learn about something I know very little about: The invention of an app! It was only a couple of years ago that people teased me about my phone, saying things like, “Your phone has buttons!” That’s why I’m so excited to host Stephen Smith, who created nOCD, an OCD therapy app for people who may not have easy access to treatment, maybe because they live in a remote area or they can’t afford to regularly see a therapist. I’m also excited because I didn’t follow a traditional treatment plan myself, and I understand how difficult it can be to find the right treatment provider. Stephen set out to tear down barriers to effective treatment—and from here I’ll let him explain why, and how. First things first: Like most of my Q&A guests, you have OCD. How long did you experience symptoms before you were diagnosed? And what made you realize that you may have the disorder? In retrospect, I remember experiencing OCD symptoms in high school. I always feared that I would suddenly get cancer, sometimes to the point where I would make my family take me to the hospital. However, I didn’t realize my symptoms were OCD-related until after my sophomore year of college. I started having very intense, uncharacteristic intrusive thoughts (with mental compulsions), different from the cancer-related ones I experienced before, so I knew something wasn’t right. After a certain point, the thoughts became so extreme that I knew I probably needed to find help. Unfortunately, due to the lack of awareness for OCD and OCD treatment, it took me five different tries to find someone who specialized in OCD. Before I found an OCD specialist, I had one clinician regularly tell me to snap a rubber band on my wrist after every intrusive thought. Another advised me to move away from my family, since they believed my childhood was the root of the problem (bad advice for treating OCD). How did you feel about the diagnosis, and how did you go about treating your OCD? I felt very relieved about my diagnosis, because it provided me with much needed hope. 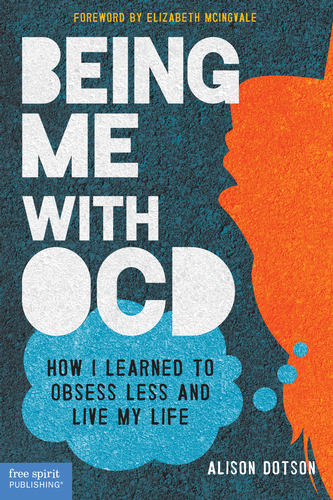 Before being diagnosed, I constantly felt depressed and anxious, thinking to myself “What have I become?” When I learned about OCD treatment, I read that other people were going through the exact same thing, and most importantly, many of them got much better. Why did you create the nOCD app? I created nOCD in light of the problems I faced: (1) finding treatment and (2) going through treatment. Like I mentioned before, it took me five tries to actually find a clinician who was well versed and experienced in clinically effective OCD treatment—exposure and response prevention (ERP) and mindfulness-based therapy. That’s why the app incorporates both ERP and mindfulness-based therapy. Tell us how the app works. nOCD can help patients mindfully respond to a sudden OCD episode (instead of performing a compulsion) and stick to a structured ERP plan. In the background during use, the app collects objective, real-time data, which can be easily shared with a therapist, family member, etc. The data can then help OCD patients easily explain the details surrounding the war going on inside their head in a non-verbal way, and remember the events that occurred during the week. Lastly, with the new version of nOCD being released in a couple of weeks, patients can engage in auto-generated ERP exercises that naturally will take them through their hierarchies. For instance, during each exercise, users can create in app loop tapes, scripts, drawings, etc. Their therapist can even customize their different exposures for them. I grew up in a relatively small town and wasn’t diagnosed with OCD until I was in my late 20s and living in Minneapolis. If I still lived in my hometown, I’m sure I’d have to travel to see a therapist. Was this a factor you considered when developing the app? What else went into the decision? I was very fortunate that I didn’t have to drive very far to see an OCD specialist. If I did, I can guarantee you that I wouldn’t be able to seek treatment due to the combined cost of travel and therapy. At the time, I was barely able to even pay for the local OCD specialist. Each week, I had to work overtime as a trainer/custodian at a San Antonio (Texas) boxing gym, since each therapy session cost me $195. Many who aren’t familiar with OCD treatment may ask: Why was the cost so expensive? The answer: the only OCD specialist in my area was “out of network.” Because these specialists are in such high demand (given the cruel nature of OCD), many can afford to charge whatever price they fancy. It’s another problem in OCD therapy that must be solved, and I am confident technology will eventually solve it. Although nOCD currently has many tools that improves the connection between remote patients and their OCD therapist, we still are innovating keeping both virtual reality and teletherapy in mind. Since you’ve launched this business and there have been press releases about it, I assume pretty much everyone in your life knows you have OCD. Was that always the case? Did you feel comfortable telling friends and family about the disorder? Before I launched nOCD, only a handful of people knew that I have obsessive-compulsive disorder. Now that many know about my journey through treatment, a countless number of people have approached me looking for help. I admire their courage, considering how difficult it is to talk about both OCD-related thoughts and actions. When I was going through treatment, I remember only telling a select number of my family and friends, because I didn’t want my reputation to change amongst the rest of the social circle. Being an NCAA athlete, I’m living proof that mental illness doesn’t discriminate, just like other chronic illnesses. I don’t fit the stereotypical mold of someone who struggles with mental illness that is commonly (and oftentimes subtly) pictured by our media, but really no one does, since mental illness affects all types of people. If you have OCD, you must know that so many people in the OCD community improve each day. OCD is the farthest thing from a death sentence, and in fact, the skills that you’ll acquire in ERP will make you more resilient than ever before. For example, before I severely struggled with OCD, I would always get incredibly nervous before playing football games, giving speeches, and meeting new people. After going through ERP successfully, I am now rarely phased by any of these three things. I now feel as if no challenge is too great! Hi, Lorre! I can try to get the answer from Stephen, but you can also follow the link I included in the first paragraph, which goes to the app website.